Unusual shape of a shell, isn’t it? That’s why the animal you see here is named Peanut – and no, it’s not a name of a species. 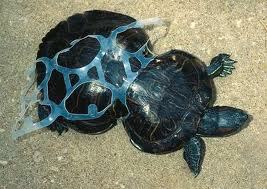 The shell disfigurement is the cause of littering the oceans – when turtle was still very young, he got wrapped by plastic 6-pack packaging.